For many the kitchen is the most important space in the their home. The majority of homes suffer from either cramped kitchen spaces from bygone eras where women were the main user of the kitchen and their concerns were undervalued, or more modern kitchens that are spacious but constructed of low quality fixtures and finishes and often a lack of functional design. Throw in a dash of dated finishes and a lack of accomodation for the breadth of modern appliance options and it's not surprising that kitchen remodeling remains one of the most popular home improvement projects. We solve the kinds of problems mentioned above by partnering with you to re-create your kitchen to reflect your tastes and the way your available space can best work for you and your family. From straightforward counter and cabinet replacements to making structural alterations creating a new floor plan, we have the experience and expertise to produce a fantastic kitchen for you. 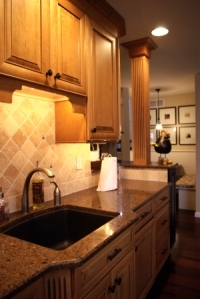 Our goal is to provide you with a kitchen that is so well designed and constructed that you will never have to consider remodeling your home's kitchen again, and to accomplish that with a client-contractor relationship fostered on respect for you, your home, and the significant investment you're making to achieve a space you'll love. Kitchen Specialists: over 10 years of experience building great kitchens on top of over 10 years of experience organizing and cooking in kitchens professionally. Client Focused Service: we're dedicated to your hapiness with not only your fantastic new kitchen, but the process that brings it into being. Designed for Life: A functional design that considers all the details ahead of time leaving you with a great space instead of regrets. Not Just Beautiful, Durable: Superior craftsmanship goes beyond picture perfect trim details and flawless tile installations. Our kitchen projects are built with the best materials and methods backed up by a 5 year workmanship warranty. We are capable of providing you with full design services including: floor plans approved by a highly experienced and licensed structural engineer, and fixture and finish selections by trained interior designers. We're also happy to tailor the design process to your needs. If you prefer: be your own interior designer and employ our experience to help you navigate the endless choices involved in a kitchen project. If you have a designer or architect you plan to work with we have a great track record of simultaneously satisfying our clients and their chosen design professionals. Contact us by phone, email or our webform and we'll discuss what you're looking to accomplish and in what time frame you're looking to accomplish it. We'll come visit you at your home so we can discuss specific issues with your current space and take preliminary measurements. Usually on a follow up visit we'll present you with either a written project proposal (a ready to sign contract for less complex projects), or an estimate range and a proposal to begin a Design and/or Cost Analysis process (for more complex projects). We'll begin to flesh out your design with specific fixture and finish selections by bringing design selections to you or accompanying you to showrooms depending on your preferences in the design process. We elminate confusion and redundant showroom visits with out unique approach to pricing finishes and fixtures. We simply pass on our (often discounted) cost directly to you so there is no confusion during showroom visits about meeting budget constraints, saving you time and money! This also gives you the flexibility to purchase fixtures yourslef if you're out and about and you see something you can't live without, or catch a fantastic sale. At whatever point you're most comfortable (during the design process or after a full design and complete down to the penny cost) we'll present you with a detailed project proposal including estimated start and completion dates to begin the construction process.